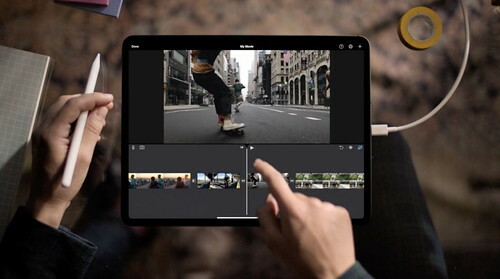 Apple’s new iPad Pro: USB-C – and video editing. Photo by tua ulamac on Flickr. A selection of 13 links for you. Fewer for the rest. I’m @charlesarthur on Twitter. Observations and links welcome. Thus, maybe Spotify is already nearly big enough to do this, and could do so next year. Does Apple Music offer enough of a counterbalance to this? That the labels could go there instead? Probably not, given Spotify’s size. you’re here to learn about the screen, so I’ll just tell you that it’s great — at least compared to the old MacBook Air. It’s not True Tone, but it is a full Retina Display with the same resolution as the 13-inch MacBook Pro. The smaller bezels make a big difference in making the computer more portable, but it doesn’t feel cramped like the smaller MacBook sometimes can. The bezels are black, and the whole thing is a glossy glass now, which might annoy some people, but that’s most laptops these days. Bottom line: it’s pretty much on par with the screens on the MacBook Pros from what I can see. The keyboard is Apple’s “3rd generation,” which is another way of saying that it has super minimal key travel but is a little bit quieter and (hopefully) a little more dust-resistant than older MacBook Pros. It’s also been fine-tuned to try and fix some of the big issues that plagued the initial and follow-up runs of MacBook Pros over the last two years. It’s still pretty clacky sounding, though, but I’ll need to take it into a quiet room (no easy feat right now) to really see how it sounds. It’s still a polarizing design, even this many years in, but I don’t think that’s a reason not to upgrade. Build quality is top notch, as you’d expect. The device, like the new Mac mini, is now made of 100% recycled aluminum, a first for Apple’s laptop line. The lid opens with a single finger to reveal the massive touchpad, which is Force Touch now. I’m glad there are two USB-C ports, both Thunderbolt-enabled, but I am just a little sad that MagSafe is truly dead now. Overall, the trade-off is worth it, I think, but you are probably going to need to buy some dongles. There’s a headphone jack, too, which is a thing that I have to mention simply because it’s not a given anymore. I didn’t get a chance to test out Touch ID, but I’m pleased to see that Apple figured out that it was the best part of the Touch Bar MacBook Pros, and it bought just it and the T2 chip over. It’s a lot more button-like than what you’ll find on a MacBook Pro. Much as I like this new design, there is one thing that rubs me the wrong way, and it has a lot to do with the mixed messages Apple is sending. In its presentation, Apple made it clear that music professionals like DJs have been fans of the iPad for awhile and that the new power afforded to them by the A12X Bionic chipset would help them spice up their performances. That’s cool and all, but I wonder how those DJs feel about the iPad Pro lacking a headphone jack. Seems kind of important, no? People who lean on iPad Pros to actually get stuff done should benefit from the A12X Bionic, a tweaked version of the chipset we first got to know in the iPhone XS. I haven’t been playing with these iPads for too long, and it’s difficult to tell exactly what kind of performance gains to expect based off these demos. That said, the handful of AR apps I tried out seemed smoother and more stable than ever, and a setup dedicated to visually lush DJ software looked appropriately rad. We’ll see how they do in real-world testing soon. Speaking of important, how about that USB-C? The shift has been rumored for years, but it’s finally here, and it stands to change the way people think about how to use iPads. In the past, if you wanted to hook other devices up to your iPad, you’d have to rely on peripherals and connectors to bridge the gap between Lightning and whatever else your hardware required. Moving to a standard USB-C port makes the new Pro line feel more akin to a proper computer, and Apple has already pitched several ways that professionals have been able to work these iPads into their daily flows. Pretty good accompanying video. The squared-off design reminds me of the iPad..4, was it? The USB-C won’t support an external hard drive, since you’re wondering. Apple’s cluttered product lineup is hardly a new problem, but the situation with its laptops is now getting a little bit silly. The company is selling three laptops at roughly the same price with little beyond potential battery life to differentiate them. For instance, of the trio, two are considered for the “thin and light” crowd, offering small size at the expense of power. But the smaller of the pair costs $100 more, despite having a slower CPU and weaker graphics. The revived MacBook Air, meanwhile, makes the MacBook look like even more of a misstep than it was before. After all, unless you’re seriously hankering for a laptop that small, why not just buy its far-better sibling? If the 12-incher was sold for, say, $899, then it would be much easier to take it seriously. And that price isn’t an unreasonable proposition, either, since the 11-inch MacBook Air sold for that much before its axing. Obviously I’m not linking to this just because it links to my article with 14 graphs about Apple’s financial performance. He has a point with the $1300 price; the ASP for Macs overall (laptops plus pricey desktops) was around $1450 in midyear. When the MacBook / Air / Pro can all be bought in some form at the same price, things are indeed messed up. [Tim] Cook highlighted a few features shipping in 12.1, most notably a Group Facetime feature that will support a whopping 32 simultaneous participants. FaceTime uses on-device intelligence to display the most prominent speakers on the call, automatically highlighting the current speaker by bringing them to the forefront. It automatically sizes each person’s image depending upon how active they are in the conversation, based on duration of speech, volume and even motion. Participants who are not active will appear at the bottom of the screen until they speak. A simple tap also brings a participant front and center. Additionally, dual-SIM support via eSIM, which was announced as an upcoming feature in September, will finally be enabled for iPhone XS and XR models. And Cook said users can expect an additional 70 emoji throughout iOS, which are largely made up of this suite of characters announced earlier this year as part of the Unicode Emoji 11.0 set. Cleverly, if you join one of these FaceTime love-ins after it has started, you don’t ring in. I’d like to think it’s going to be better than standard conference calls. A few years too late to win the enterprise market, though. [The billionaire Tom] Steyer and his coalition say that the problem is simple: A.P.S. [Arizona Public Service, the largest utility in the state of Arizona] is an investor-owned company, motivated primarily by its responsibility to protect profits for its shareholders, many of whom reside out of state. In 2017, the company made $488m, an increase of $46m from the previous year. The Arizona Corporation Commission (A.C.C. ), a five-member elected “fourth branch” of state government, is supposed to keep the utility’s monopoly in check—setting limits on capital investments and pricing, while guaranteeing a certain margin of profit. But critics have long argued that the arrangement incentivizes utilities to “gold-plate,” or make inessential investments. (The phenomenon even has a name: the Averch-Johnson effect.) For A.P.S., a $200m gas-fuel plant would be more lucrative than a $20m solar array because the utility can charge higher rates to recoup its investment costs. One targeted journalist “had his mother in the Bronx get a bomb threat. You can muddy the story of ‘oh but the first amendment’—you’re a lawyer. You know that doesn’t hold up in the US and that private companies can have moral systems if they’re not discriminating against protected classes. Last time I checked, Nazis weren’t a protected class.” Stripe declined to comment on the email. Researchers from the University of Michigan C.S. Mott Children’s Hospital looked at more than 100 apps, mostly from the Google Play app store, and found that nearly all of them had at least one type of ad, often interwoven into the apps’ activities and games. The apps, according to the researchers, used a variety of methods to deliver ads to children, including commercial characters, pop-up ads, in-app purchases, and, in some cases, distracting ads, hidden ads or ads that were posed as gameplay items. The authors suggest that the deceptive and persuasive nature of the ads leaves children susceptible to them, because of their lack of mental development in controlling their impulses and attention. Children use mobile devices one hour every day, on average, highlighting the importance of researching what they encounter and how it may affect their health, Radesky added. with reCAPTCHA v3, we are fundamentally changing how sites can test for human vs. bot activities by returning a score to tell you how suspicious an interaction is and eliminating the need to interrupt users with challenges at all. reCAPTCHA v3 runs adaptive risk analysis in the background to alert you of suspicious traffic while letting your human users enjoy a frictionless experience on your site. In reCAPTCHA v3, we are introducing a new concept called “Action”—a tag that you can use to define the key steps of your user journey and enable reCAPTCHA to run its risk analysis in context. Since reCAPTCHA v3 doesn’t interrupt users, we recommend adding reCAPTCHA v3 to multiple pages. In this way, the reCAPTCHA adaptive risk analysis engine can identify the pattern of attackers more accurately by looking at the activities across different pages on your website. In the reCAPTCHA admin console, you can get a full overview of reCAPTCHA score distribution and a breakdown for the stats of the top 10 actions on your site, to help you identify which exact pages are being targeted by bots and how suspicious the traffic was on those pages. If this means I don’t have to be the human doing the work spotting traffic signs for Google’s self-driving cars before I can visit a page, I’m all for it. This punctuated evolution in discourse is fascinating – at least on the small organisations. It’s like they built a road and they’re standing there watching cars crash into each other continually, and saying “wow, look at that” rather than seriously trying to just close the damn road. Does “support of Donald Trump or his administration” cover: immigation? free trade? tax cuts? law-n-order? Supreme Court nominees? If Trump is compared to Hitler and his administration to Nazis, are you allowed to say that’s overwrought? (oh how times have changed!). As a somewhat follow-up to yesterday’s thought regarding 50% of the population is below average, right now I see 42% of the US approves of Trump. That’s not a majority – but it’s big chunk of the country, not a few outliers and tail effects. While they say they won’t permit witch-hunts, it’s not clear to me how they can resolve the tension between a narrow rule which only catches people not glib enough to use the proper code-words, and a wide rule that is basically thought-policing.